Syngonium chiapense is unlike most Syngonium species. 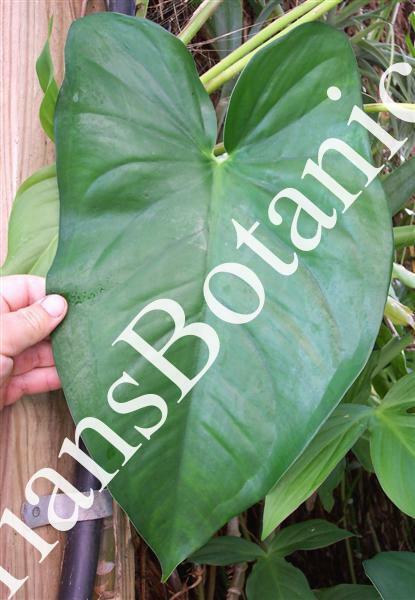 I have seen it called a Philodendron many times by collectors. The first give away is the white sap which is not seen in Philodendrons but often in Syngoniums and Xanthosomas. The leaf is much different than other species usually having a bit of a rubber texture to it when mature. The foliage is also an odd color more a green to glaucous in color which is not often seen in collections. The foliage is also unlike other species in the fact that it does not segment or split as it matures. The leaves keep and large hastate look to them and can get over 2 feet long. The petioles are often a light blue green color with white powder like substance on them. Plant is well rooted in a 6 inch pot and should be potted up in something larger and allowed to climb.